The history of our Estate started in the middle of the previous century when the grandfather of Jean Luc Lassoudière (the current co-owner of the farm with Dominique & Françoise Montez et Hélène Audouin-Lassoudière) came back to Saint Fraigne to rebuild the family farm and give birth to a new vineyard. The philloxera crisis of the 1870s had destroyed a large part of the vines in the Cognac region and many farmers at the time were forced to move away, looking for jobs. It took a lot of hard work to reinstate the vineyards to their former glory. In the 1970s, the farm started to produce wine in a sufficient volume and with a quality that allowed the supply of major Cognac houses. The farm owns about 25 Ha of vines, of which 20 Ha are dedicated to the production of eaux de vies for Cognac. The remaining Hectares are used in the production of Pineau des Charentes, grape juice and red wine. Our Cognac wineyard is mainly planted with UgniBlanc (90%), Colombard and Folle Blanche making the rest the grapes. Varying each year, the production can reach up to 100Hectoliters per Hectare. If you need about 1kg20 of grapes to produce 1 liter of wine, 7 liters of that wine will be distilled to produce 1 liter of eau de vie. As soon as the grape are ready, the harvest season begins, typically early in October of each year. The distillation process usually takes place between early November and the 31st of March of each year, in our 40 years old traditional Charentais Alambic. The unfiltered wine is introduced with or without lees into the boiler. The heat of the boiler brings the wine to boil. The alcoholic vapors then emerge, accumulate in the “chapiteau” and then engage in the serpentine. In indirect contact with cold water, they condense to flow in the form of “brouillis”. At the end of the first distillation, the “brouillis”, containing between 28 and 30% volume, is again poured into the boiler for the second distillation, where this time the distiller will “cut” in order to obtain the core allowing the Creation of Cognac. The heads, first fractions that flow, will be disrigarded, alongside the seconds (although sometimes used) and the tails which will arrive at the end of distillation. The liquid is ready to be transferred into barrels for the next stage, aging. Aging is paramount for a brandy to turn into a cognac. It is typically carried out in barrels of 270 to 450 liters. Cognac is a living product. During his long stay in French only oak barrels, sheltered in the cellars, it will integrate what the wood has to give to build its color and its final bouquet. The substances extracted from the oak wood by the alcohol will modify the physical appearance of the cognac, giving it a color that goes from the golden yellow to the mahogany. This transfer of the natural characteristics of the oak causes, over time, the formation of “rancio” and develops the bouquet of cognac. Following aging, the cellar master will proceed to the assembly of eaux-de-vie in order to create a product that will please the customers. The Cognac obtained must be constant, that is to say that the customer will have to be able to find the same flavors from one batch to the next. This work is very delicate, similar to what could be the blend of perfumes, with precise notes. 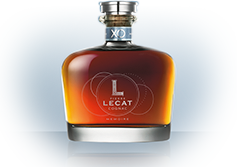 Tasting a Pierre Lecat Cognac is always a unique and unforgettable moment.